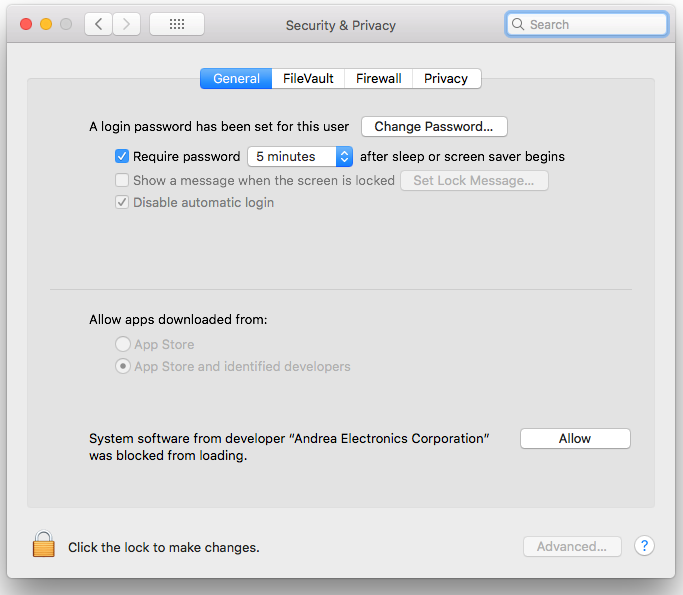 At this point the user should push the “Open Security Preferences” button, which takes you to the following page in system preferences (the user could also just open Preferences to this page). The user needs to push the “Allow” button. However, if the user just pushes “OK” in the first message and doesn’t go to Preferences and push the “Allow” button, this “Allow” option disappears after 30 minutes, never to appear again, leaving the system in a state where the Andrea noise reduction filters are disabled. Then when the user opens the audio control GUI it states “No USB audio device is attached”. If the user didn’t push the “Allow” button, they can get the “Allow” button to reappear by re-installing the software. When they re-install, they will NOT get the first message again, but if they go into Preferences within 30 minutes, they can push the “Allow” button to continue with a successful installation. Click the button below to add the Andrea Audio Software for Mac (Version 3.0.0) for use with: Mavericks and newer version of OSX to your wish list.